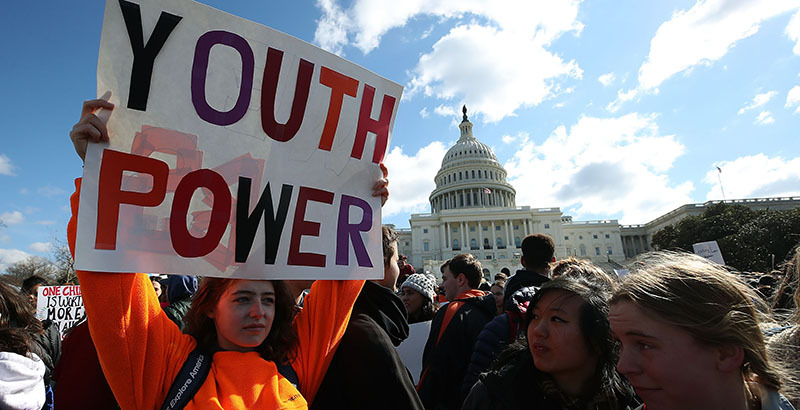 From coast to coast, hundreds of thousands of students participated in the National School Walkout earlier today, demonstrating against gun violence while also paying tribute to the 17 victims of the Parkland, Florida, school shooting exactly one month ago. Politics and prayers in D.C. Hundreds of high school students from the greater Washington area held their 17 minutes of silence at the White House — turning their backs on the occupants inside — before rallying at the Capitol in favor of gun control. The students had some star-studded backup, with Democratic lawmakers walking out of the Capitol to address them. Meanwhile, across town, a Catholic elementary-middle school turned thoughts and prayers — widely dismissed as empty gestures — into a meaningful tribute to the Parkland victims with a prayer service not just for the Florida school but for schools across the country. Most students who marched out of their classes Wednesday morning were teenagers, but a small group of Jersey City parents used the opportunity to teach their young children about civic engagement. About a dozen parents stood with their elementary-school-age kids on a sidewalk outside the building, talking about how difficult it is to discuss something as horrific as gun violence with a 5-year-old. Sometimes, all a kindergartner can say is, “Boo guns! Yes flowers and hearts.” And sometimes, that’s enough. In the affluent, solidly purple Minneapolis suburb of Edina, high school students spent exactly 17 peaceful minutes in the parking lot, chanting, waving signs, and consoling one another. Having been the site of several recent controversies regarding the limits of student and teacher free speech, the district took no chances with security. Police cruisers were on prominent display at several schools, but the only observers who turned out were mothers in bright T-shirts advocating gun control. The 74’s Video Director James Fields captures on video the massive walkout at the elite, 5,800-student Brooklyn Technical High School. He also records the poignant and on-point voices of students like junior Divya Tulsiani: “I definitely get emotional because we are talking about the future plans of these [Parkland] students, some of whom were getting ready to graduate, some of whom were getting ready to compete with their teams. We as Brooklyn Tech students are lucky enough to still have that privilege. Unfortunately, because of a lack of commonsense gun control at the federal level, the students at Parkland who lost their lives are not able to carry their future plans.” Watch the walkout here.